For the last two nights a small Owl has been banging into our back window of our house. Tonight we got a picture of him. 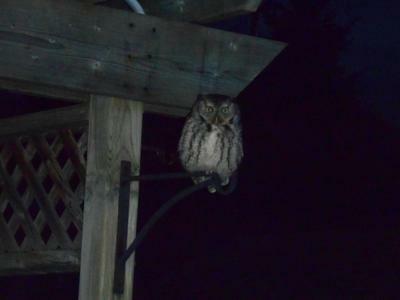 Thank you for sending us your picture and report of your Owl sighting. I'm not sure what type of Owl this is, but perhaps one of our readers will know. This will appear on our website, and you can see more reports of animal sightings on our Facebook page Discover Southern Ontario! Yes, this is an Eastern Screech Owl. More than likely looking for voles or shrews in the yard! Wow! I wonder what he was doing? Such amazing eyesight they have but he was banging into your home? Maybe he was picking up on the sounds of rodents or some small critters in or on your roof. Confused? Would be interesting to find out what he was up to? Please let us know if he's still visiting? Join in and write your own page! It's easy to do. How? Simply click here to return to Owls.